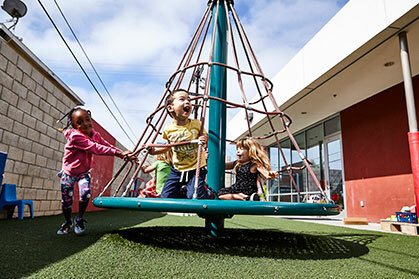 St. Joseph Center has an innovative model for its Early Learning Center (ELC). Based on a philosophy that all children deserve a safe, supportive and nurturing environment that supports holistic development (physically, emotionally, cognitively, etc. ), the program encourages children from varying backgrounds to explore and discover through both play and interactions with peers, adults and their surroundings. We serve both low-income families and any family in our community seeking high-quality childcare for toddlers and pre-K children. This socioeconomically diverse setting helps children with varying needs thrive academically and achieve their full potential. Tuition rates are reasonable and flexible schedules are available. Enrollment is limited, so waiting lists may apply. “Dual-immersion” bilingual (English-Spanish) classrooms are a key part of ELC’s model. Exposure to a bilingual environment early in life within a nurturing educational setting opens up new possibilities for every child enrolled. Children learn to respect diversity and empathize with people who are different from themselves. Please download our program brochure to learn more about our innovative model, and contact ELC staff at 310-396-6468 ext. 358 for more information about enrollments.